CVA calculations are among the most computational complex calculations performed by investment banks. They are used to adjust the prices of derivatives for the cost of counterparty credit risk, and calculated in a Monte-Carlo simulation with many time steps. 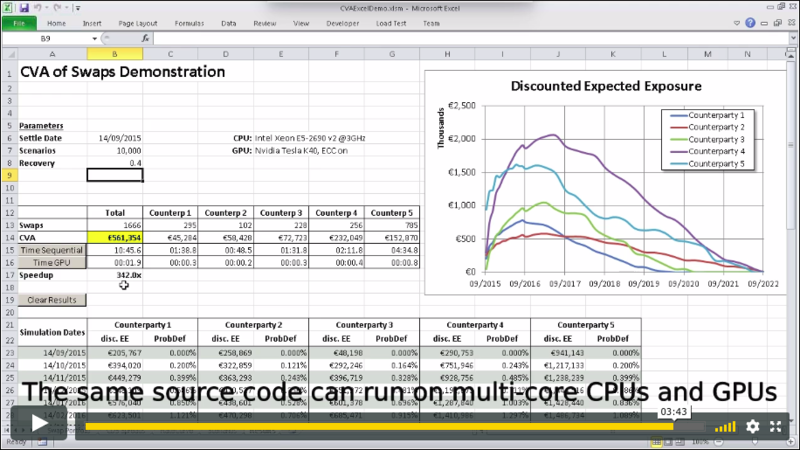 This video demonstrates how the Xcelerit SDK can be utilised to accelerate the CVA calculation on a portfolio of swaps – both on multi-core CPUs and GPUs from the same source code. The required code modifications to go from sequential to Xcelerit-enabled are shown, and the results are plotted in Excel, using Xcelerit’s Excel addon.